Over the past four fiscal quarters Apple has realized a dramatic drop in its effective tax rate. As the graph below illustrates, through fiscal year 2009 Apple's tax rate remained fairly constant and above 30% of pre-tax income. In fiscal year 2010 the effective tax rate fell dramatically from fiscal year 2009 levels reaching a low of 21.1% in Apple's most recent fiscal quarter. 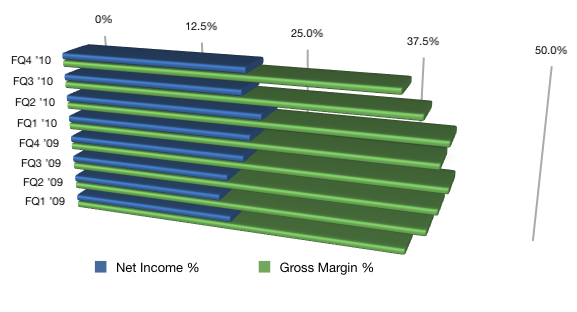 The drop in tax rates during FY2010 contributed significantly to Apple's net income performance relative to revenue. 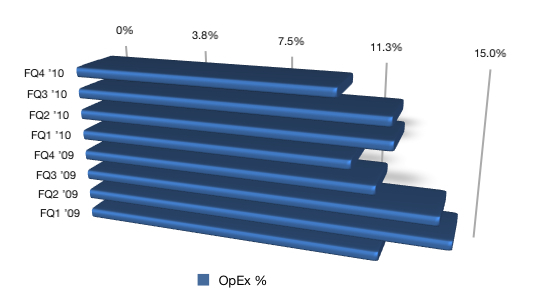 Operating expenses (or opex) consists of research and development expenses and general, selling and administrative expenses. The percentage of opex expenses relative to revenue will usually scale down as revenue rises. As the graph below illustrates, operating expenses as a percentage of revenue can vary significantly by quarter and materially impact each fiscal quarter's net income results. I will tie together these cost factors in a blog post next weekend. Thank you to Sandy Leitao for her graph creation skills using Apple's Numbers software.